Need a quick and kid-friendly smoothie recipe?! This is one is our berry favorites! Berries and coconut chunks are so delicious and healthy blended together, making a great breakfast on the go. It works really well in the reusable pouches for kids. Fill up a pouch, seal, and keep in the refrigerator for 1 to 2 days for an easy snack for the kiddos. You can make this recipe ahead of time, store refrigerated in an airtight jar for a few days. Just make sure to shake it or stir it before you drink it because it does tend to separate. You can use water instead of orange juice for less sugar; it will still be sweet from the berries and banana. Take out the yogurt for a vegan and paleo-friendly version. For extra protein, add nut butter or egg white powder. Per Serving: 265 calories; 7g fat; 50.4g carbohydrates; 4g protein; 1mg cholesterol; 83mg sodium. Delicious berry smoothie! I used apple juice instead of orange, and it was super sweet and tasty. I love to add chia and hemp seeds on top, so yummy. 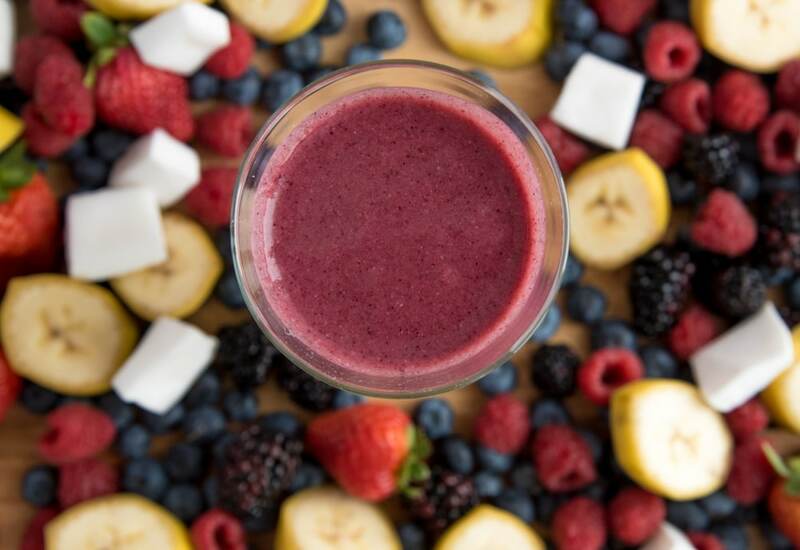 This berry smoothie recipe was right up my alley! I'm not into juicing, but I love making smoothies. I could drink this every day, it was that delicious! The ingredients are also really easy to find at the store and I usually keep them on hand.